I think it's safe to say that almost the entire continental United States is pretty miserable right now. 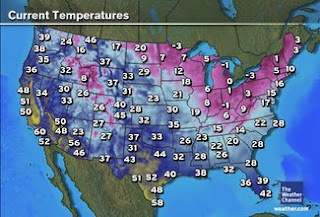 Even Florida is cold, I could have sworn I heard them whining this morning, but then I realized it was just the wind. What's the weather like in your part of town? Rainy and cold with a side of miserable? Perhaps sunny and below freezing with side of 17 mph winds?